The appearance of the individual fruit is quite pretty and rather reminds me of the burrs that can stick to your clothing when you tramp through certain rural areas. The fruit is native to Malaysia and Indonesia but is now cultivated in many places around the world including Australia, Hawaii, India, the Caribbean and Latin America. The name ‘Rambutan’ is actually Malaysian and it means ‘hairy’, which is rather apt given that the rather fearsome looking ‘spines’ are actually quite soft. Indeed, I have read that some people eat the fruit by simply biting through the skin to get at the soft, inner pulp but using a knife is a more sensible proposition to my way of thinking. Opening the fruit is actually very simple. All you need do is incise around the skin to a depth of quarter inch or so and it will peel away easily. As you can see, the pulp, which is the edible part, forms an attractive, pale white globe that can be popped out without much difficulty. The inside of the globular edible portion contains a small seed. Apparently, when the fruit is still quite young, this is fairly easy to removed but, in the case of these particular ones, the flesh adhered to the seed quite firmly and could not be removed without tearing it. It is not readily apparent, but there is also a thin papery skin around the seed rather like the skin on a peanut. The seeds are sometimes eaten, along with the papery skin but they can contain some alkaloids that are a little bitter to the taste and the skin is not very palatable. Some sources I read suggest that the bitter components are mildly toxic at some stages of the development and, while I don’t know if that was the case with the ones I bought, I thought it better to just avoid trying them at all. The taste of Rambutans has sometimes been likened to that of a grape and, to be honest, I don’t think I can come up with a better analogy. The flesh was quite sweet at the outset but there was also a little tartness as well and the combination, though fairly mild, is very pleasant. What is unique about this interesting fruit is the texture. It is a little bit like a grape in some ways but it is also much firmer and chewier and, for the life of me, I cannot compare it to anything so much as to the flesh of raw squid. I know that might sound unappealing to some people but I really enjoyed it very much. 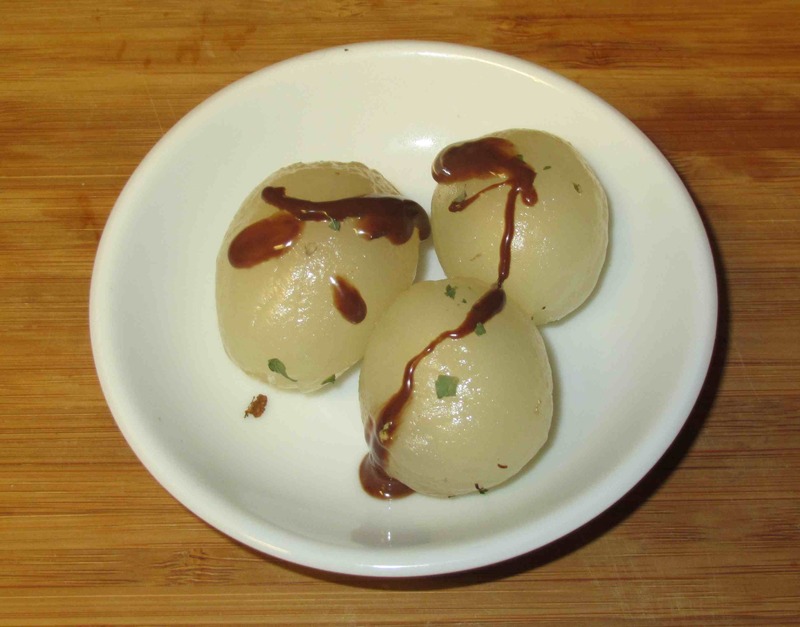 My wife’s take on both the taste and texture was that they were rather like eating a fresh Lychee. Having never tried, those, however, I’ll have to take her word for that. Wow, a very expensive rambutan. I think the travel costs for this fruit just piled up before it is sold where you got it. Your wife is correct in comparing it to a lychee. 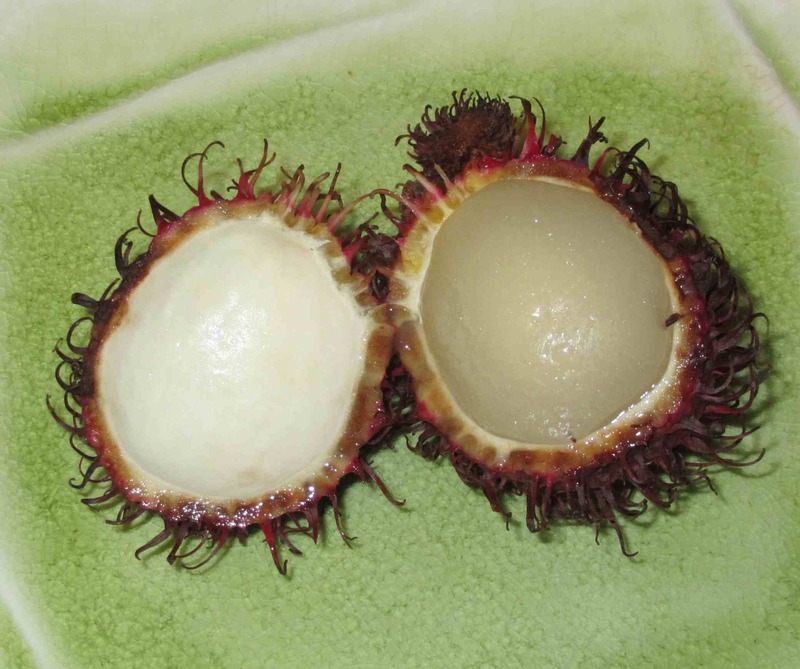 I find rambutan sweet and a bit tarty while lychee is sweet and bland. Reading this post, made me appreciate more where I am. We only have it for a dollar per kilo. There is also an interesting fruit called langsat/lanzones. Langsat sounded vaguely familiar to me but I must have been thinking of something else because when I googled it, I didn’t recognize the fruit…. I’d love to try them! We used to have a lychee tree in the back yard and preferred to eat. I love rambutan. I agree with your wife on the lychee analogy, too. Rambutan always makes me think of lychees. Right when I saw it, I wondered if it was a bit like a lychee. I love food experiments! I would love to get my hands on something fun like this. Great post! 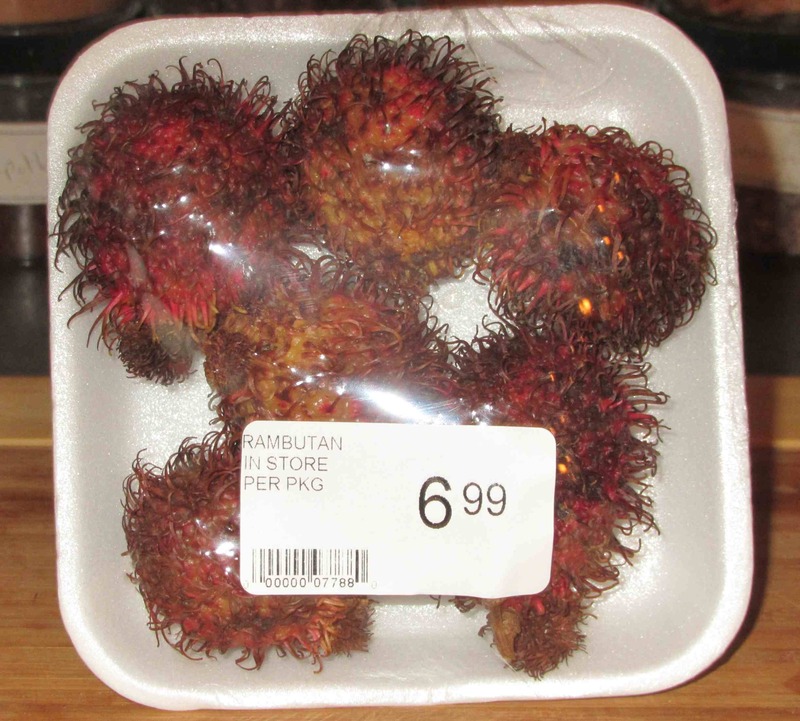 Love Rambutan, but alas, our fresh variety is also very, very expensive, so I always opt to eat it at a Thai restaurant that has a prix fixe menu! Delicious huh? 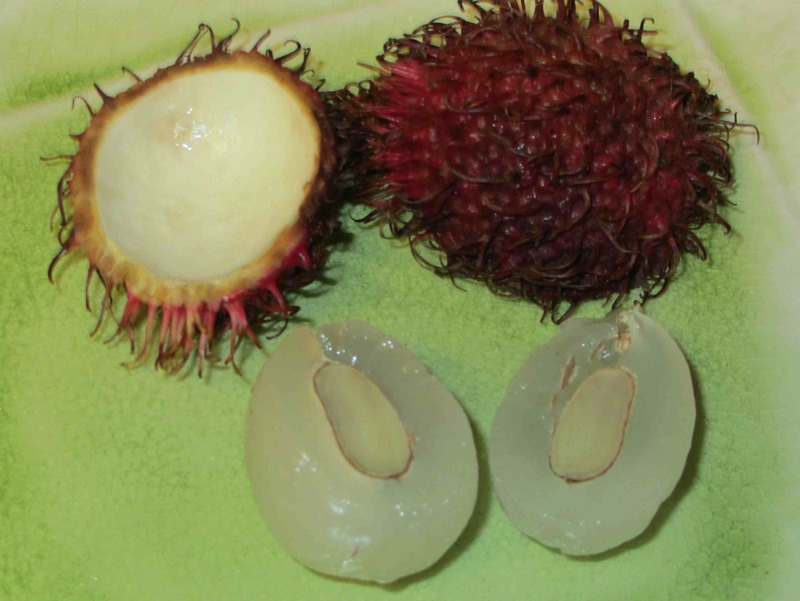 Other similar fruit are: lichees and longans (or dragon eyes). Each look different and are delicious. I actually didn’t try rambutans until a yr. ago. I think it was that funny shell that initially put off. How wrong I was!!! I would describe all these fruits like a fragrant grape. 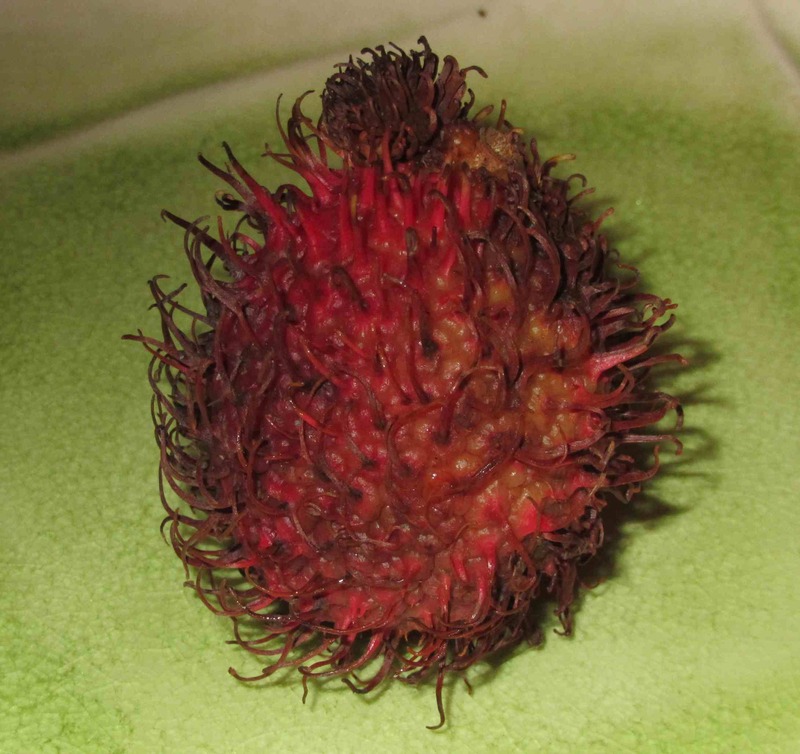 Agree with your wife and other commenters, rambutan does taste a bit like lichee. No worries at all! I usually always have formatting issues (Don’t know why things decide to dart around when I hit publish… grrrr…. ), but I always like it when people point it out to me. Hopefully the feeling is mutual or I’ll feel like a complete tool! Not at all Charlie … usually my wfe catches mistakes I miss but she is away travelling at the moment. BTW. I see you are from NB…. I grew up there! I agree – lichee. It is a shame transport adds so much cost to things. But there are plusses and minuses in all living locations. Hope you find some cheaper so you can try some experiments. I always look forward to the experiments. What interesting little critters – the outside reminds me of a sea urchin and the inside of a lychee. Normally, I just take it “fresh” , never tried with topping. ha! Never tried this but was always curious to know how it tasted. Now after going through your post, i am pretty sure i am giving it a try. Rambutan also grows in the southern part of the Philippines. I was told (I never did a research on it to confirm) that there is a variety of rambutan whose flesh can’t be easily removed from the seed. This is one of my favorite fruits, and just like in your neck of the woods, rambutan is also expensive here. I have always eaten it plain though. I’m in Tampa Bay and bought a box of fresh rambutans yesterday for $12. I had never tried them before. It’s October 6 2014 today. If someone wants me to ship a box of fresh ones I will for shipping and small handling. I think there were about 40 in the box — I didn’t count them — so that’s lots cheaper than buying 6 for $7 like in this package. I have no idea what the season is. I was told these were grown near Miami. I’m guessing the box is about 14 inches long, 8-12 inches long, and 3-4 inches deep. rob pinion hot mail. I think they are delicious and slightly better tasting than fresh, ripe lychees, but it’s a little harder to separate the fruit cleanly from the pit and so you get a little of the pit’s wrapping paper (very thin) with the fruit usually. That happens with fresh lychees too. Canned anything of this sort doesn’t come close to the refreshing, lively taste of the fresh variety. My neighbor has a longan tree, and I have the same opinion, though I don’t like longans nearly as much. The farmers market has longans too, but I didn’t price them. They’re supposed to be stored at 55 degrees F according to the box. I put mine in a cooler with a little ice. If I had room, I’d put them in the fridge, but that would be closer to 40 degrees.